Art-making also works when a group of specialized artists—or even artists of different mediums—come together. We re-learned this important principle last year when we collaborated with other dancers for a performance at the Afterimage Gallery in Riverside. Our piece was part of an exhibition called “Hanging Out” that featured music, spoken word, and fine art as well as dance. “On the Line” is an ongoing project by scholar and artist Susan Ossman that began with a painting she created from seeing laundry on a clothesline in Morocco. Last winter, in conjunction with the project, Ossman taught a class at UC Riverside and curated a culminating exhibition—“Hanging Out.” Students in the class, along with professional artists from a range of disciplines, created work to reflect on the vanishing practice of hanging clothes on the line. We joined as representatives of Riverside’s dance community. We were both particularly interested in meeting after viewing each other’s choreography and hearing about each other’s projects. “Hanging Out” became the perfect way to work together. Ossman’s vision for the exhibition was collaborative from beginning to end, in large and small ways. We took that collaboration as our operating principle, too. Often, multiple perspectives make these kinds of projects challenging, but our experience was smooth. We had a central theme, out of which many ideas sprouted to be shaped into a whole. We invited dancers from the community whom we had worked with before or were interested in working with. Six responded: Samantha Carlson, Rebekah Johnson, Erica Johnson, Lindsey Lester, Valerie Mendez, and Tracy Tom-Hoon. In our current economy, professional dancers often cobble together an assortment of jobs or work full-time while squeezing dance in. The dancer who manages to support herself merely through dance is quickly becoming extinct. The eight of us work at a variety of jobs besides performing, ranging from a post at Costco to teaching at a local studio. Yet we were able to find times to rehearse together. Another challenge for independent dance artists is finding rehearsal space to work. When they finish up university training and make their way into the “real world,” there’s a large gulf for dancers to cross if they want to continue in dance. Where can these artists develop their craft if they cannot afford to train at a studio? Riverside has overcome some obstacles to become a dance hub—a base where multiple colleges, dance studios, and lovers of dance come together. We were fortunate to have temporary access to space at the Culver Center of the Arts to create the “Hanging Out” piece. As we began our work, we were also grateful for the freedom offered by Ossman. She let us think about how to occupy a small gallery and interact with art. The notion of “airing out our laundry”—the material that hugs and protects the body in an intimate way—formed the heart of our piece. We wanted to think about the facets of our lives that we decide to reveal to others, as well as those we prefer to keep hidden. We wondered if the desire to air out fragile and intimate moments of our lives changed over time. So we interviewed people at a range of ages to learn about the parts of their lives they choose to expose. To begin the process, we recorded the voices of several women at The Grove, a senior living facility in Riverside, inviting them to share something private that they might tell a close friend only. This question seemed to call up a flurry of fond memories, and broadened our collaboration out into the community. In a different rehearsal, dancers chose tiny spaces in the studio—a window frame, a corner marked off by a chair, a door jamb—and developed movement within the enclosure. Dancers then came into the larger studio but kept the same “tiny space” feeling. Each dancer approached the task with interest and whimsy: Lindsey investigated low-level moments she had created behind an open closet door; Valerie choreographed a phrase in response to dancing against a beam between windows. Dancers also paired off and alternately performed their tiny dances. The idea was for each dancer to support or constrict the movement of her partner by using contact. One could move, maneuver, or guide her partner for a moment or two and then the roles would switch. The notion of a single “genius” artist holds strong in our society. Yet when many artists come together they can create something larger, and possibly more complex, than a solo artist might. What if we opened up our projects to groups of interested people more often? Art could be less of a struggle and more of a liberation. This spring our work will continue to unfold. Ossman has received more funding for “On the Line” and the project will be exhibited soon at our public library. 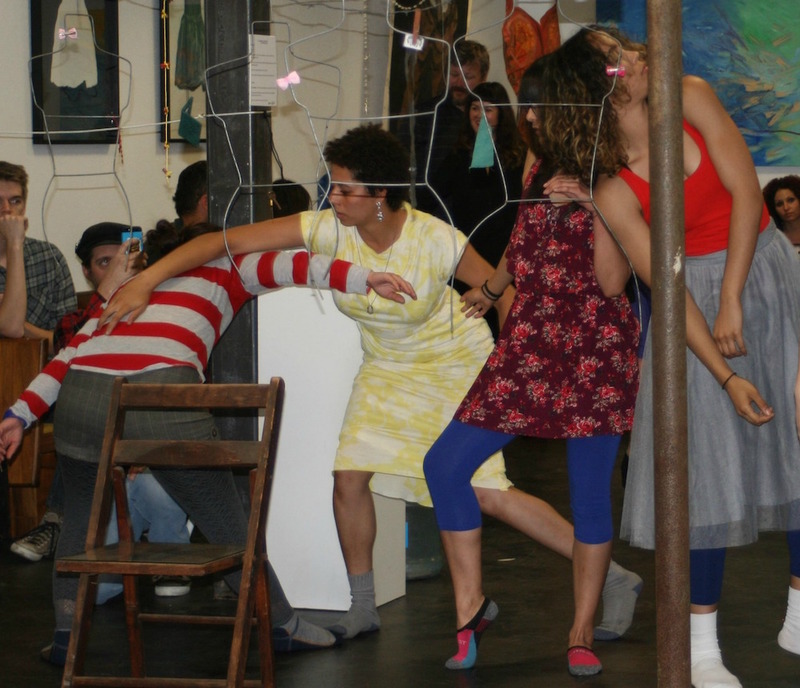 We will bring new dancers to the work we will develop—on outdoor stages shaped by visual artists in library gardens and parking lots in the Arlanza, La Sierra, and Casa Blanca neighborhoods. The project continues to demonstrate the emergence of Riverside as a space for innovation in the arts and an environment where dance can thrive. Sue Roginski is a Riverside-based dance artist and educator, and a co-founding member of P.L.A.C.E. Performance. Casey Avaunt is a doctoral student in critical dance studies at UC Riverside who also teaches dance at Mt. San Jacinto College and Norco College.